Kids love sugar. Unfortunately, so do bacteria. They feast on the sweet stuff, leaving behind acids that eat away tooth enamel and create cavities. 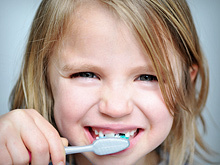 It can be hard, however, to know how much sugar is too much for your child’s oral health. The staff at North Pole Dental Workshop understands. Family dentist Dr. Bauer and his experienced team know that finding the right balance can be confusing, as can navigating the various kinds of sugars that appear in your child’s diet. Sip Water, Not Sugars: Kids’ cups are a favorite hideout for hidden sugars. Sipping juices and sodas is like giving your teeth a long, lingering bath in sugars. Skip the sweet drinks in favor of water, which will actually support oral health by washing away food particles. Seek Instant Gratification: Sweet snacks continuously coat your child’s teeth with sugar for as long as it takes to eat them. For a sweet treat that won’t increase your chances of an emergency dentist visit, bypass the lollipops and hard candies in favor of quickly consumed delights. Select Healthier Sweetness: The easiest way to moderate your child’s sugar intake, of course, is to limit sugary snacks. Please both your child’s sweet tooth and the rest of their smile by helping them develop a taste for natural sugars. Fruits, vegetables, and dairy products contain natural sugars and are a nutritious part of any growing child’s diet. Fresh fruit, in particular, offers satisfying sweetness without the detrimental effects of added sugars. Even with a wholesome diet, regular visits to your family dentist are key to keeping your child’s teeth healthy and cavity-free. Your child will feel safe and calm in the relaxing environment at North Pole Dental Workshop, while you’ll feel confident knowing they’re receiving expert dental services. Call (907) 490-4650 to book a dentist appointment for your child today, or visit their website to learn more about their services.